It’s hard to describe the feelings that come with the countdown to a hospital date. The March 21st cath was scheduled on the books sometime before Christmas. When it’s months away, it feels kind of good to have a milestone to shoot for–an event where there may be some progress, some new information and maybe a new game plan. But the closer the date looms, the more ominous it gets. At about a month out, Trish and I both notice that things start getting more complicated. There are times when I just wish it would come so we could be done with waiting–and then I remember that this involves Rudy getting strapped to a table, needles, anesthesia and a bunch of instruments getting stuck into a very delicate beating heart. No matter how balanced one tries to be, it’s unavoidable to get your hopes up that it will end with a good report–maybe because the bad reports still sting so badly even when you think you did the best you could to prepare for the worst and not get your hopes up. As a friend recently wrote on her blog, you can get “under-sensitized” on this journey and go into it thinking “No big deal. It’s not surgery. It’s just a cath”–losing sight of the fact that no normal parent in their right mind would be dismissive of this. There’s a weight that comes with the wait. It starts heavy and just grows. Not sure there’s any way to lighten it but having a full schedule to occupy us sure helps. At our best, it feels like we’re being defiant and not letting this weight crush us from living our lives. Or maybe we’re not all that tough and it’s just fear driving us to do anything we can to distract ourselves. It’s hard to come up with ways to lighten things at 4am, but it’s surprising how even in the midst of an otherwise fun and consuming activity, the reminder of what’s on the horizon can hit you with a pang, a gasp or a shiver. That brings us down to one week to go, when all of this stuff can cycle around in your brain at warp speed. I think we do a pretty good job of holding things together, but to be honest there’s a lot of turmoil just under the surface. Productivity in the house and work goes down as it gets increasingly hard to focus. Emotions cause you to say things you might not normally say, or misinterpret what someone else might be saying. While staring into space is not all that constructive,a few stupid spousal spats make the case that it might have been a wiser activity to maintain. The whole intensity is raised a notch when it just so happens that several of the families we’re close to in the blog world have all had hospital episodes this week. Paxton had a big surgery today. Owen had a cath this week. Josh had one last week. Moriah’s headed in for some stuff this week too. Always a comfort to know you’re not the only ones going through this stuff, but with that come the twists and turns that anyone walking with someone in these circumstances feels. That’s not to say it’s been all that somber. Life goes on. There’s been good reason to have fun and we’ve drunk deep. The weight’s there–not sure there’s much we can do about that. So instead of thinking too much about whether we’re acting in defiance or running in fear, we’ve had fun just doing life. Funny is still funny and fun is still fun. What’s coming is coming, but there’s still such beauty in life. 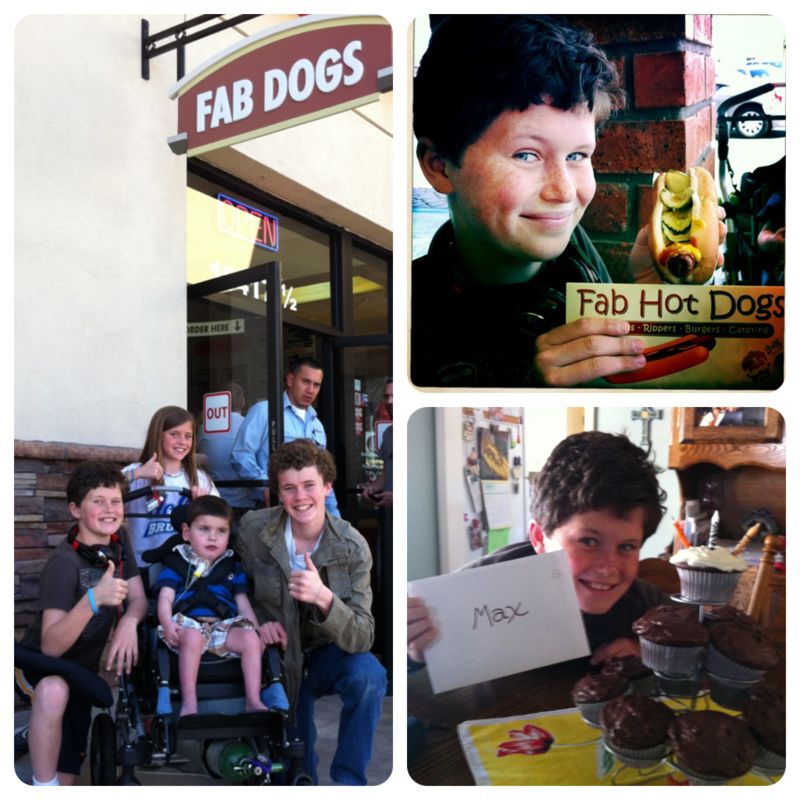 March 10, 2012 - Max's 13th Birthday lunch at Fab Dogs in Reseda. Our primary reason for being in LA was to celebrate Lisa and Daniel’s wedding! A joyful day with a family that’s very special to us. 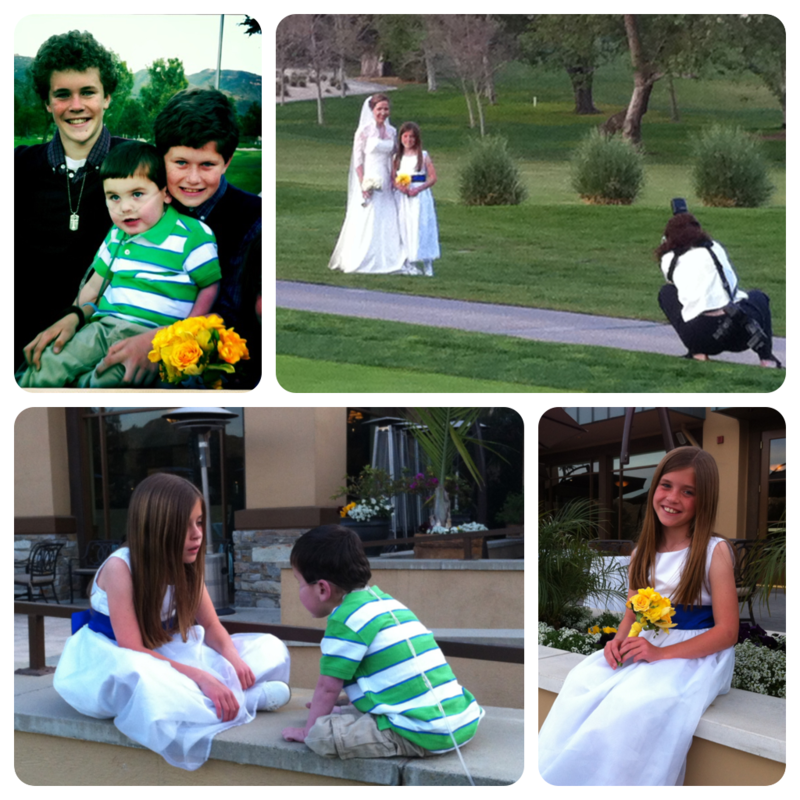 Livy was very honored to be the flower girl and fulfilled her obligations beautifully. Trish was asked to sing and Wilson and Max backed her up for a memorable performance. 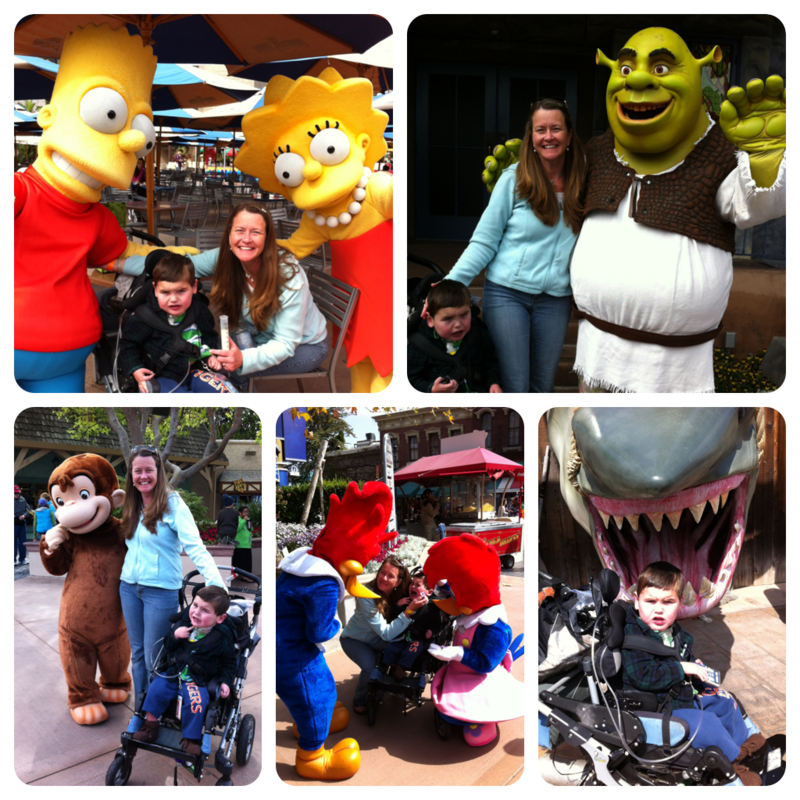 Max’s birthday celebration continued the next day with a stop at Universal Studios. 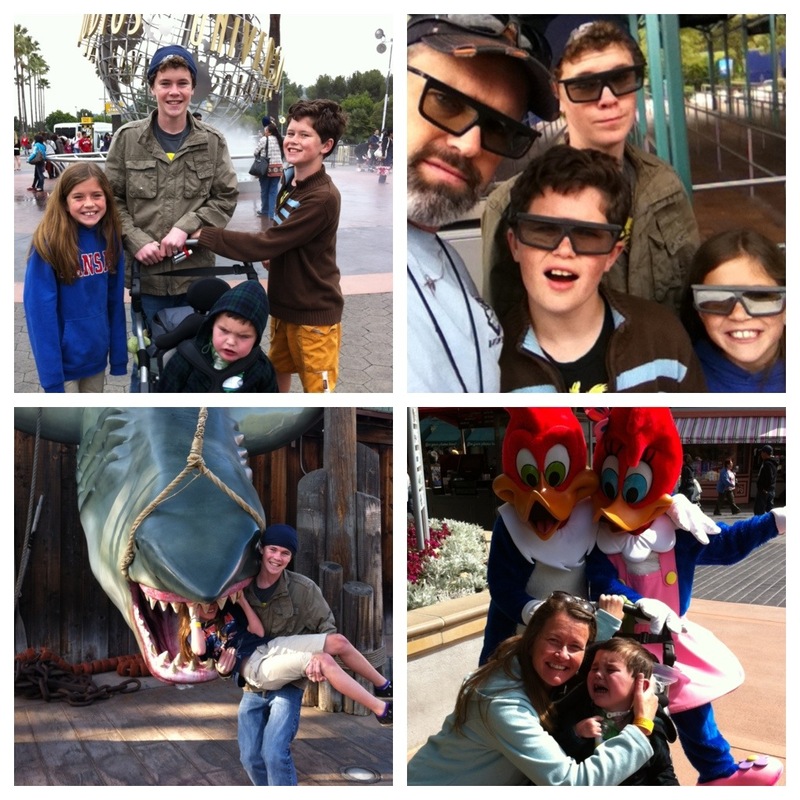 March 11, 2012 - A belated birthday celebration at Universal Studios Hollywood! 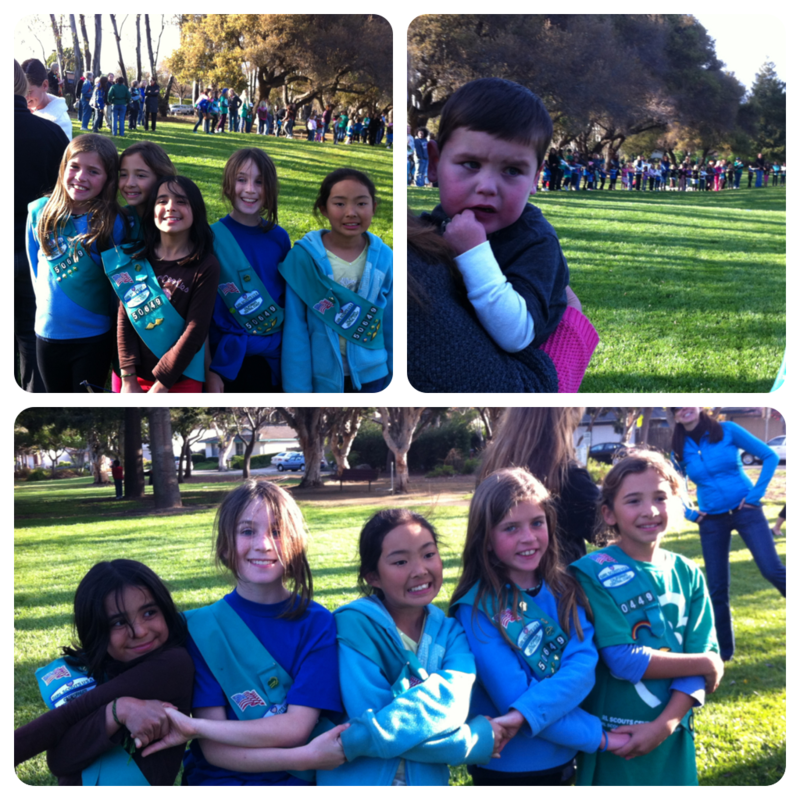 March 12, 2012 - Girl Scout 100th Birthday! Rudy loved being with the girls in the park but was NOT keen on the council-wide friendship circle ceremony! 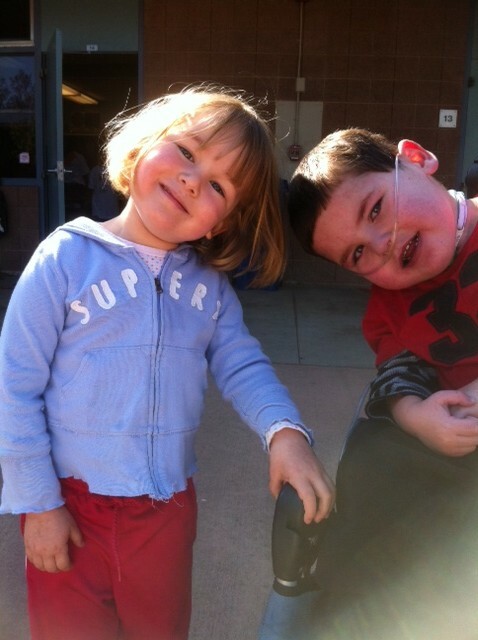 Rudy and his gal pal Stella...can't miss an opportunity to post these two cuties together! Rudy going to school this week..."hands on the window" is a daily bus ritual. More activity to come this week as Oma and Opa are about to land and they’ll find that taking interest in their grand kids will involve making some choices between the Jr. High Musical, drumline performances, surf lessons, an elementary school track meet, a church talent show and the regular Rudy routine. We appreciate your prayers for our family as we count down to next Wednesday. My dear Rolf and Trish, I feel so deeply and am so concerned about the stress you are under all of the time. I pray for your health and for your relationship due to this unbelievable stress which is relentless. I have always clung to I Cor. 10:13 and claimed it many times in my life. Yes, God is faithful and does enable us to “bear it”. My love and prayers are constant for you and the children. Having Franz and Helga there will help you gain strrength and perspective. Be safe,………………… Mama. Praying you all continue to enjoy life as you get ready for Rudy’s cath. Praying all goes well and good news is coming. Rudy looks great! Love all of the photos. Happy Birthday to MAX. We love love love you all! I’m with Grandma Jo here. Your stress level is consistently through the roof. And I’m guessing all the usual high activity of having three healthy kids keeps you distracted from time to time. But sometimes I worry and wonder if maybe…just maybe…you need a teensy bit more downtime, just to process everything. But then again, ‘stupid spousal spats’ happen anywhere, anytime, don’t they? What you’re doing is just plain hard. You can try to be matter-of-fact about it, but I fear you’re destined to failure there. And I’m not convinced that ‘success’ is even a desirable goal at this juncture. Sometimes you just have to sit for a bit with all the crap – the fear, the worry, the sadness. I am so grateful for all the joyous things you have been able to celebrate. But I am also painfully aware of the heaviness of constant fear that underlies every waking moment, sort of like a volcano. So when I read a post like this, I actually thank God for it. Because it means you are processing, your are dealing – as much as it is possible for us frail humans to deal – with all the painful pieces of this beautiful Rudy boy you’ve been gifted with. And he is beautiful. And you do have much to celebrate. And then to give deep thanks that you’re in it together – because together, with your amazing older children, you are your own small community, residence of the Holy Spirit, and source of Light and Truth for all of us who watch and wait on the sidelines. We love you all so much, and are glad Oma is there to give you hugs from us too. We stand with you and hope our prayers hold up your arms for the task, like Moses’ friends in his battle. Appreciate your honesty and insight as you travel this difficult road. We think and pray often for you all. Rolfie…we’ll catch up this weekend. Thanks for your “up-lifting” gift! Love you guys! This “Rudy’s Beat” so touched our hearts – as they all do and we “ditto” all the beautiful comments made by others. We realized we had gotten a little “hasty” in the way we pray for you, so we just stopped everything and prayed for you and for the strength that you need from the Lord to keep striving for as much “normal” as your situation allows. Thank you for keeping up this journal of your family’s journey with Rudy and your honesty for not only all the good times, but the hard times as well. We love you. Prayers for all of you! Give Oma and Opa a big hug from us. We still miss them very much!! I love you Geylings, and am praying for you. Lord, in your mercy, hear our prayers and give your good gifts to the Gelying family today and especially on the 21st. We need you.